[Image: Algae balloon communities in Iceland by the Philadelphia-based 202 Collaborative]. A few years ago I audited a course about Archigram at the University of Pennsylvania, just something to do on a Wednesday morning before I went to work – but one of the things that indirectly came out of that experience was BLDGBLOG. It's interesting to note, then, that one of the other people in that class now writes Brand Avenue; another's work was featured here on BLDGBLOG last year; and, this morning, another course attendee emailed to point out a proposal that he's helped assemble and conceptualize, about hydrogen-powered urban design in Iceland. [Image: Algae balloons and the houses they serve, by the 202 Collaborative]. 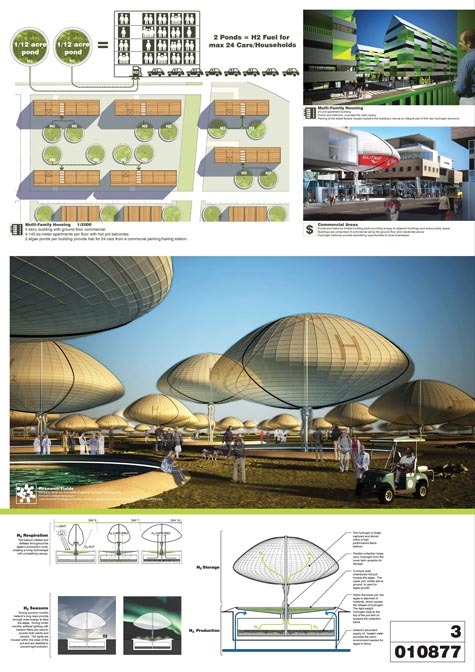 That project, originally intended for a design competition, imagines carefully engineered algae ponds and balloons of hydrogen gas fueling the Icelandic city of the future. It's Icelandic New Energy (INE). 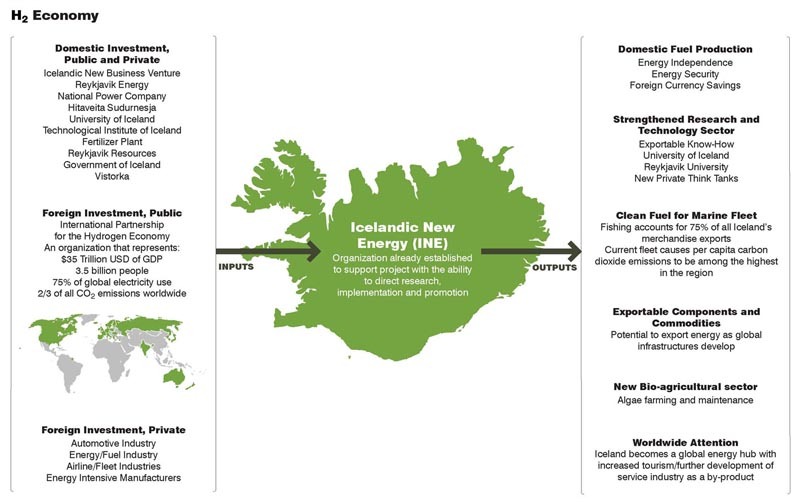 [Image: An Icelandic hydrogen economy, outlined by the 202 Collaborative; view larger]. It has long been known that algae produce small amounts of hydrogen as a byproduct of photosynthesis. In 1999, researchers in Berkeley observed that algae alternate between hydrogen production and normal photosynthesis depending on the chemical environment. Depriving algae of oxygen and sulfur, the researchers greatly increased the hydrogen production and triggered the algae to produce hydrogen for an extended period of time. Another research group also discovered that algae will sustain simultaneous production of hydrogen and oxygen from water by illuminating the algae and depriving it of carbon dioxide and oxygen. Researchers estimate that a small pond (1.5 acre or 10 meter diameter) will produce enough hydrogen on a weekly basis to fuel 12 cars. Of course, a part of me wonders if this whole thing would be easier to solve if we just got rid of those 12 cars – but I understand that that wasn't the point of this design exercise. However, referring to things beyond the scope of this project, a part of me does find it a bit depressing that we'll go to all these lengths – we'll totally redesign the industrial base of society – only to jump back into our Escalades and drive out to buy organic cotton Christmas mittens at the local Baby Gap. It seems like an awfully long distance to go to get nowhere, in other words. After all of this, we'll do the exact same things, outshopping one another on greengoods.com and parking our solar-powered sustainable sports cars somewhere in that sprawling tangle of garages and freeways that we never disassembled out back. Everything will be recycled, yet everything will be the same. We'll watch internet sitcoms and judge each other's social value by the hemp dresses that our girlfriends wear. In any case, that's a pet peeve of mine that deals with things well outside of the project featured here. [Image: A broader view of the plan by the 202 Collaborative; view much larger]. These renderings are gorgeous, meanwhile, and they lead me to wonder what Archigram would be doing today, if they had grown up designing in a world powered by alternative fuels. What strange new worlds of hydrogen balloons and algae ponds extending off past the urban horizon might we then see? Crops harvested from the roofs of brick tenements in north Philly. Steel frameworks of solar concentration arrays visible in the cracks between buildings as we step over bio-boulevards and water filtration systems on our way to work. 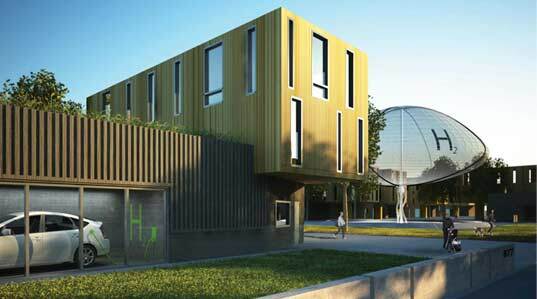 All narratives of the future are fair game when you're talking about architectural design. Anywho, although their site is still under construction, be sure to stop by the homepage of the 202 Collaborative. I'd like to eliminate the 12 cars, too, but, I'd rather see these cool algae balloons strategically placed throughout urban areas. Shouldn't there at least be "No Smoking" signs under all those containers of (highly flammable) hydrogen? I'd be curious to see the math that came up with a constant 12 cars worth of power from a 1/12 acre of algae. Considering they are specifying Iceland, a country whose amount of light varies drastically over the course of a given year. Is it just me, or wouldn't this change the output from photosynthesis? Open fields full of balloons of hydrogen... only useful in a world without exploding terrorists, or Iceland. The paragraph says the ponds need to be 1.5 acres, but the diagrams show 1/12 acre. 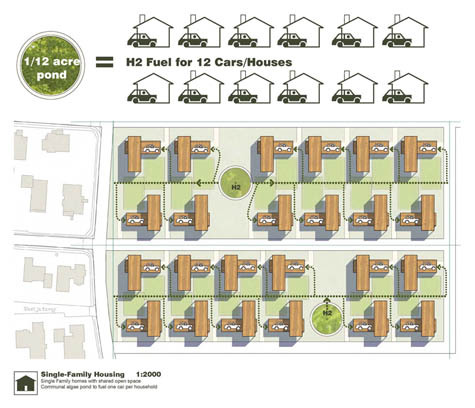 The 1/12 size seems to match the size of the houses in the diagrams as well, so which is it? 1/12 acre is a lot smaller than 1.5 acres. After all of this, we'll do the exact same things, outshopping one another on greengoods.com and parking our solar-powered sustainable sports cars somewhere in that sprawling tangle of garages and freeways that we never disassembled out back. Uh, you really think so? Lets build houses that bloom? Seriously. It's prettier too. A carbon dioxide drawdown organism living on your roof. I agree with your pessimistic sentiments that regardless of vision, current human nature will override any attempt at innovation. Its part of still being contained within the petroleum age. That zeitgiest is not near its own death, of its own accord, and although we are heading much closer to it in a fin de seicle-esque way, it won't be next year, or even 10 years from now - and thats completely unfortunate. A design vision is really in the realm of spirit because it is an applied science in service of a pure science - invention and possibility. The virtual is always trumped, even violently, by the blind but present age where in people have an endless appetite for comfort over freedom and entertainment over actualization. Granted, that is THE paradigm of western culture so its nothing new. It just seems so depraved and disgusting lately - but perhaps we are just cycling back into another Romantic era, our collective libido growing tired of the decadence/decay that has result from far to much comfort (ie, the complete dissolution of modern will in the face of unprecedented access to information). I think the design is quite interesting, and definitely visionary. Unfortunately, the systems which have set themselves in power during this age will keep such changes at bay, lest they loose their thrones. I thought the "1/12 acre" was a typo for "1 1/2 acre", because the earlier text says "1.5 acre". But the earlier text also says "10 meter diameter"; and a 1/12 acre pond would be 10 meters in radius (20 meters in diameter). A 10-meter-diameter pond would be about 1/50 acre. There seems to be a lot of inconsistency in these numbers! GE tried something like this with worms in town dumps. The worms help the generation of methane for possible energy use. The project could not be scaled up economically I think. What the Architectsural visionaries miss is that the enrgy (from methane form dumps or hydrogen form algea) is of very low thermodynamic value until it is copressed to a usable level. This compression uses energy --there is no free lunch. The whole power cycle has to be considered before such an idea can be applied pragmatically--thats why God made Engieers after he made Architects. BTW how will the dead algea be disposed of --or will they be turned into ethanol in a biofuel plant Ta Da!